Recommended Smell Removers That Work! Odor absorbers are highly effective in purifying air in industrial and commercial establishments. Odor absorbers such as SMELLEZE natural deodorizer granules eliminate odors by absorbing them instead of simply masking it. These units are efficient at controlling and eliminating odors that are caused due to mildew, chemicals, sewage, decayed organic matter, paints and smoke, and need little maintenance. Odors absorbers can be safely used in industrial units, garbage compactors, manufacturing plants, food storage units, automobiles, disaster areas, boats and dry cleaning facilities. Implementing a daily cover program is crucial to controlling the spread of unpleasant smell. Soil and similar material can be used for this purpose as it effectively seals odors released from waste. Areas that tend to remain undisturbed for longer time periods till they are completely filled need an intermediate cover. This waste can be covered with a layer of soil that is at least 12 inches deep. Vegetation can be used for the final cover and at intermediate layers while paying close attention to areas for gullies and erosion rills. Leachate breakouts are a strong source of odor and stressed vegetation indicates landfill gas migration. Odor released from both these sources can be efficiently controlled using active gas extraction. A final cover also needs to be installed once the final placement of the waste is completed. Active gas extraction has become the gold standard for controlling landfill odors. It is a highly efficient means when employed with an effective closure plan. When a landfill gets saturated in terms of capacity, vertical extraction of gasses can be employed to control odor. In case of large landfills that remain open for years, a closure may not be possible and this leaves zero scope of active gas extraction. This is when landfill gas odors are produced and to overcome this issue, horizontal trenches need to be excavated for collection of gasses. 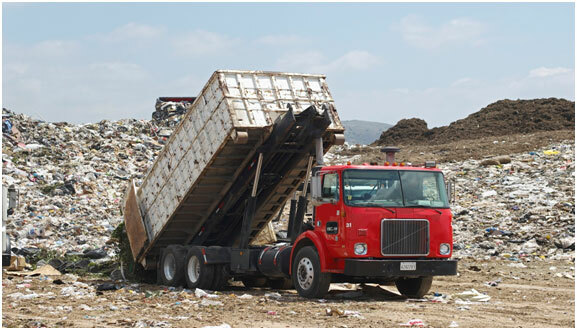 Modern landfills use active gas extraction to reduce gas odors efficiently. Depending on your industry type and nature of waste produced, you can consult an expert who is well acquainted with the new waste concepts or send your waste samples to a lab to identify the source of odor and develop a solution that eliminates the root cause. When organic compounds decompose, methane gas is produced which can be easily collected under vacuum. Methane is a potent greenhouse gas which can be converted to electrical energy. The excess gas that cannot be converted is to be safely destroyed in the form of a high temperature flash. A specific order of plants belonging to the Zingiberales species is known to have odor reducing properties. Another effective odor reducing composition can be prepared from banana plant extracts that are derived from the Musa genus. Consider using ODOREZE™ which is a proven plant based deodorizer specially formulated to eliminate landfill odors. A gas collection and control system is designed to maintain negative air pressure to facilitate efficient collection of gasses within the landfill. It is highly effective at preventing any gas leaks. The collected gas can then be used for power generation. The key takeaway in odor control is that landfill sites should release negligible off-site odors and hence the waste management industry must minimize and mitigate the nuisance of unpleasant and hazardous odors. The most efficient way to controlling landfill odors is to identify the source and control it using innovative trash management technology. Is Your Backyard Full of Chickens & Odor? Thank you for all the great information, very informative! I’m attending an open forum of this very same issue this week and am so happy I can get educated beforehand! Simply click on the Facebook Like to activate the blog submission form to send us your smell, indoor air pollution, cleaning and spill related information. Please send us your smell, indoor air pollution, cleaning and spill related blogs for publication on this site at no cost. We will consider including 2-3 relevant and ethical links for high quality blogs. Please do not send us blogs that are not related to odor.